214 pages | 20 B/W Illus. Socio-environmental crises are currently transforming the conditions for life on this planet, from climate change, to resource depletion, biodiversity loss and long-term pollutants. The vast scale of these changes, affecting land, sea and air have prompted calls for the ‘ecologicalisation’ of knowledge. This book adopts a much needed ‘more-than-human’ framework to grasp these complexities and challenges. It contains multidisciplinary insights and diverse methodological approaches to question how to revise, reshape and invent methods in order to work with non-humans in participatory ways. 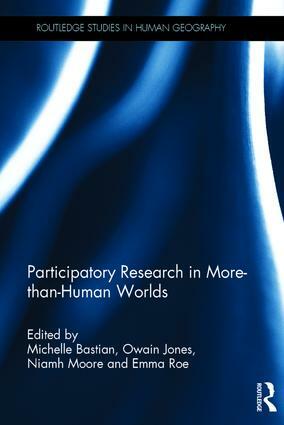 The book offers a framework for thinking critically about the promises and potentialities of participation from within a more-than-human paradigm, and opens up trajectories for its future development. It will be of interest to those working in the environmental humanities, animal studies, science and technology studies, ecology, and anthropology. Michelle Bastian is a Chancellor’s Fellow in the Edinburgh School of Architecture and Landscape Architecture at the University of Edinburgh, UK. Owain Jones is Professor of Environmental Humanities, School of Humanities and Cultural Industries, University of Bath Spa, UK. Niamh Moore is a Chancellor’s Fellow in the School of Social and Political Science at the University of Edinburgh, UK. Emma Roe is Lecturer in Human Geography, University of Southampton, UK.